Heat recovery single-room air handling unit for supply and exhaust ventilation. Maximum air capacity up to 60 m³/h. Heat recovery single-room air handling unit for supply and exhaust ventilation.Efficient energy-saving single-room ventilation of flats, houses, cottages, social and commercial premises.Ideal solution for simple and efficient ventilation of new or refurbished premises.Heat recovery minimises ventilation heat losses.Controllable air exchange creates individually set microclimate. The casing is made of polymer coated steel plates, internally filled with 15 mm thermal and sound insulation layer of PE foam.The hinged front panel of the casing ensures easy access to the internals for maintenance.The unit is powered via an integrated power pulser with a wide range supply voltage range from 100 to 240 V and frequency from 50 to 60 Hz.The unit is supplied with a power cord and a plug for connection to power supply.Compatible with round Ø125 mm air ducts. Axial fans with EC motors provide air supply and air extract.EC motor technologies meet the latest engineering demands for saving energy and for high-efficient ventilation.Low energy demand due to implemented EC technologies.The fan motors are equipped with a built-in thermal overheating protection and ball bearings for a long service life. Install one FRESHBOX 60 unit in each room requiring ventilation.One unit is able to provide efficient ventilation in a premise with area up to 35 m2.Surface wall mounting on an outside wall from inside the premise.Suitable for wall thickness from 100 up to 500 mm.The hole spacing for Ø125 mm air ducts with a master plate included into the delivery set.Install the AH FRESHBOX 60 outer hood (separate order, ref. accessories) on the outer wall. The unit is equipped with a plate counter-flow plastic heat exchanger with a large surface area and high heat recovery efficiency.Heat recovery efficiency reaches 79 %.The air flows are fully separated within the heat exchanger. Odours and contaminants contained in the extract air are not transferred to the supply air flow.Heat recovery is based on extract air heat recovery for warming up of suply air. Extract air transfers most of its heat to the intake air flow. 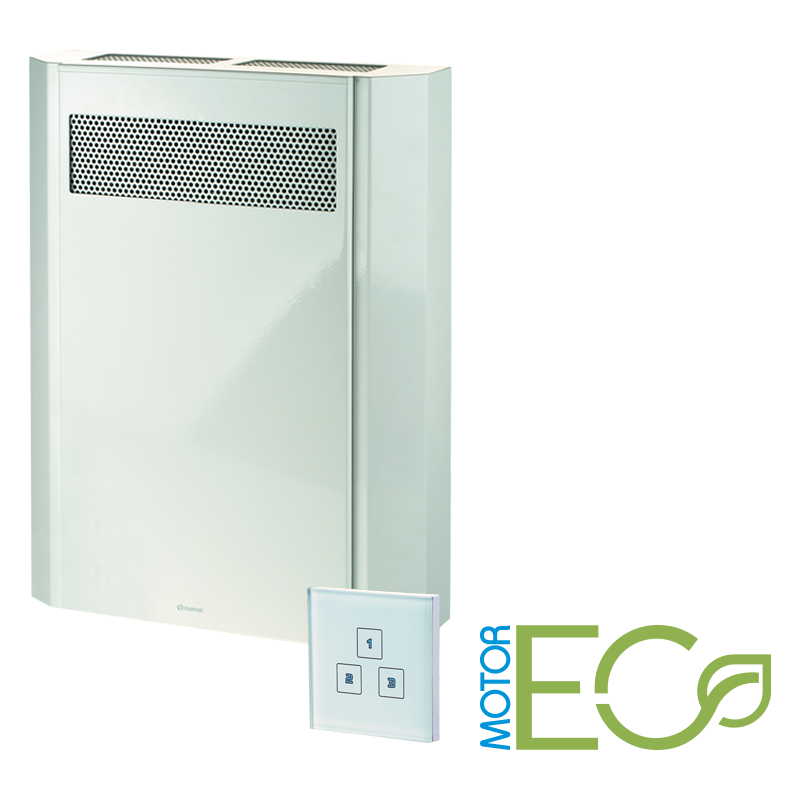 Heat recovery reduces heat losses in cold seasons. In summer the heat exchanger performs reverse and transfers a part of the accumulated coolness from the cooled extract air for cooling down of the intake air. This contributes to better performance of the air conditioner in ventilated premises. The integrated freezing protection system switches the supply fan off in the cold season in case of a freezing danger communicated by the temperature sensor to enable warming of the heat exchanger with the warm extract air flow. When a freezing danger is over the supply fan turns on and the unit reverts to the standard operation mode. Supply and extract air cleaning with two G2 filters.The filters ensure fresh air supply, free of dust, insects and prevent contamination of the unit components. The unit is operated with an external sensor speed switch that enables switching the unit on/off as well as setting low, medium or high speed mode. cardboard master plate (2 items); plastic Ø125 mm, 500 mm long air duct (2 items). For capital construction or refurbishment. The air ducts are mounted at the preparatory construction stage. The unit and the ventilating hood are mounted during a final construction stage. cardboard master plate (1 item); plastic Ø125 mm, 500 mm long air duct (2 items); stainless steel outer hood. Fully-featured solution for a complete single-stage unit mounting. For air intake / exhaust and prevention of water and for-eign objects ingress into the unit.